Daily Illuminator: Munchkin Apocalypse: Judge Dredd Is Looking For Justice! February 20, 2017: Munchkin Apocalypse: Judge Dredd Is Looking For Justice! Mega-City One is a dark place. It needs the law – law like the street judges, who take on the responsibilities of judge, jury, and executioner. But in the world of Munchkin, why would you want law and order when chaos and destruction are an option? Munchkins are the ultimate enemy of law and order! 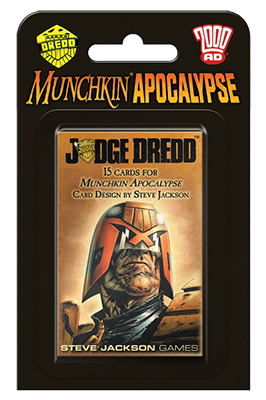 Munchkin Apocalypse: Judge Dredd is the highly anticipated booster pack for Apocalypse, adding 15 cards from the world of the hit comic series. Collect iconic Judge Dredd loot, like the Judge's Badge, to help you fight, but stay off the streets when Judge Death is patrolling. (As a Dark Judge; he's a bit more concerned with the executioner part of the job.) You also get a new Seal card to add to the end of the world! If you haven't played Munchkin Apocalypse, Seals are a unique element, and a perfect reason to pick it up. They change the game, and can even end the game early, making the person who collected the best loot the winner! This booster works with Munchkin Apocalypse and Munchkin Apocalypse 2: Sheep Impact, including the recently released Guest Artist Edition of both. You can pick up Munchkin Apocalypse: Judge Dredd later this month at your friendly law-abiding game store!